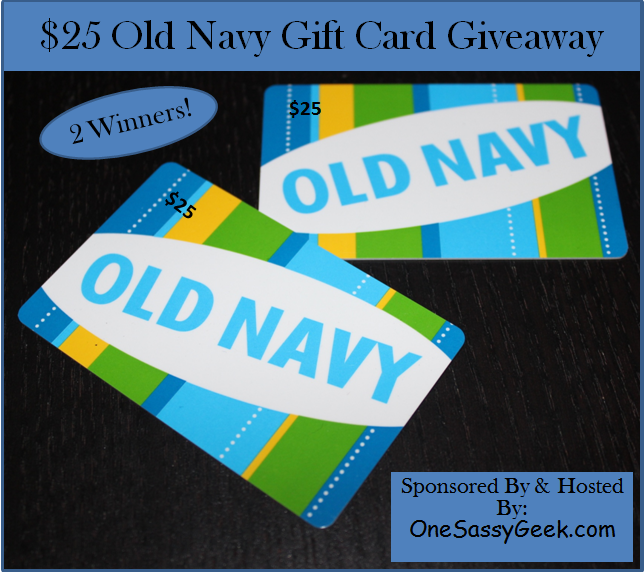 Get your shopping on with a $25 Od Navy Gift Card! (One Sassy Geek was given the product for free by the sponsor for review. Giveaway ends 3/21/14 11:59 pm EST. This giveaway is open only to the continental United States residents only and must be at least 18 years of age. The winner will be chosen using random.org. The odds of winning are based on the number of entries received. The winner will be notified by email and will have 24 hours to respond otherwise a new winner will be chosen. This event is in no way administered, sponsored, or endorsed by, or associated with, Facebook and/or Twitter, Google, Pinterest. One Sassy Geek is not responsible for lost or damage prizes. This disclosure is done in accordance with the Federal Trade Commission 10 CFR, Part 255 Guides Concerning the Use of Endorsements. Entrants must only enter with either one email address, IP address and/or Facebook account, anyone found violating these rules will be disqualified. It is at the sole discretion of the admin of the giveaway if the winner has met the rules or not.) Contact us if you questions or if you want to be featured on our the next Giveaway event! My favorite Urban Peach product is the Red, Mustard & Plum Floral Leggings. Very fun. My favorite Urban Peach product is the Navy Vintage Wrap Watch from Urban Peach! So pretty. The black oxford purse is nice! I like the Charcoal Darcy Tote Bag. my favorite old navy item(s) is just about everything in their women's active collection! looooove that stuff. I love Old Navy active wear! Love their t shirts. So comfy! The Pixie Pants look super cute! I love jeans for the whole family at Old Navy! I love their boyfriend cardigans. I like their jeans and their hoodies for boys. All summer I live in Old Navy tanks. I love that they are long enough so my white belly isn't peeking out!